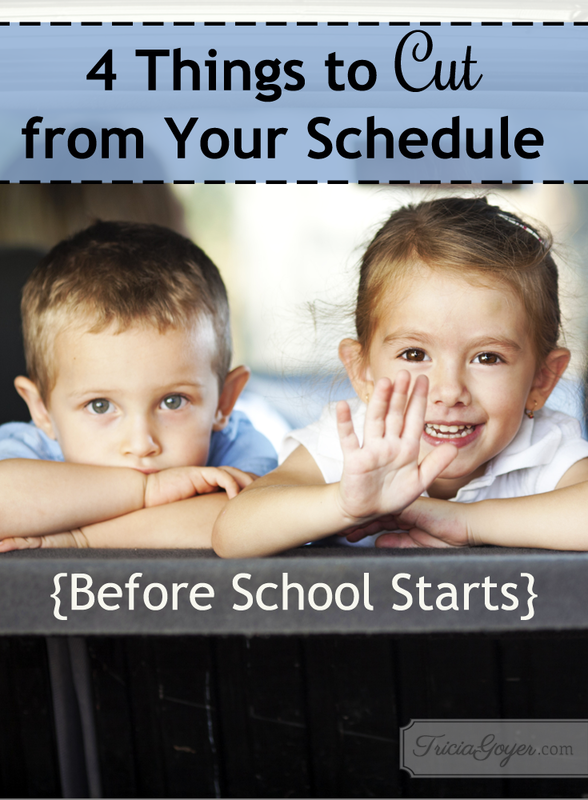 Does your schedule seem too full? Are you wondering how you’re going to survive the upcoming school year? That’s me. With seven school-aged kids I’m trying to figure out what we can add. I’m also re-evaluating what needs to be cut. God has given each of us 24 hours, and if things are too crazy-busy, it’s a sign something needs to change. And we’re the only ones who can do it. or because you didn’t want to say no. You know what I’m talking about. You signed up to help at the church . . . because all the other ladies were. You signed up to help with that walk-a-thon because no one else did. Guilt should not be your motivator. God’s directives are usually a still and quiet leading in your heart. 2. Cut out anything that doesn’t work for the season you’re in. 3. Cut out anything your kids aren’t enjoying. Yes, we often believe all children NEED to play t-ball or take dance lessons, but if they aren’t enjoying it, then why do it? Follow their lead and explore their natural gifts and talents instead. 4. Cut out anything God asks you to. Sometimes the things we’re asked to cut don’t make sense, yet God knows the future. Last year I felt God tell me to cut out a lot of my writing and blogging commitments. It turns out this year we brought four new girls into our home. Seek God. Ask Him to evaluate your schedule. Listen to His still, small voice, and obey. What about you? How do you decide what to cut or add to your schedule? Need more help or ideas? Check out these blogs! In the end, it seemed he was saying “no.” And although I was sad that they wouldn’t do it this year, I felt such freedom in that release. We are on the verge of a move and house remodel, and the dancing was just another thing. You’re right … freedom is a release!! Thank you for sharing!! I loved going to women’s Bible study Tuesday mornings. It was from 9-11. We spent the whole morning getting ready for it and waiting to leave, then by the time we got home it was lunchtime and other stuff needed done and we couldn’t seem to get any homeschool accomplished. I also realized that with homeschooling we HAD to get a good momentum going at the start of the week. If we don’t have a good, productive Monday, Tuesday usually doesn’t go that well and everything seems to fizzle out by wednesday or thursday and the week is a bust. Sometimes we’d have a great Monday, and then when I had women’s Bible study at church Tuesday, it would just stop all that momentum for the week. Does that make sense? So I had to give it up, even though it did feed my soul. It’s just not the right season in life for a Tuesday morning commitment. Yes, I had to do the same thing. I’m thankful there WILL be a season for that in the future!! !